Stalkers Transport has been providing transport solutions for more than 47 years, constantly meeting changes in demand. Accredited by FORS and backed by the fully integrated Stirling Solutions Transport Management & Accounts system & Big Change Apps full vehicle telematics and tracking suite, we have operating centres strategically located to support a National UK Distribution Service and offer our customers total commitment with an unrivalled service. By entrusting Stalkers to move your goods you know you have the full backup of their experienced team 24-hours a day, 365 days of the year. A 60 vehicle fleet with flexible specification & high payload, allows us to collect and deliver goods on the same day. We invest continuously in our modern fleet and operate our own maintenance services to ensure optimum reliability and service levels. Our key objective is to deliver the services our customers need. To achieve this aim, we provide a comprehensive distribution solution, bringing together both in-house and networked facilities to ensure we match our service to your requirements. From same day and single pallet through to full load and economy options, Stalkers Transport Services delivers. For some time now we have been helping other hauliers reduce their carbon footprint, minimise their empty running, maximise their drivers’ running time and reduce their standing and waiting times by using us as their Northern Gateway into Scotland. This concept means customers and other hauliers with groupage freight have a quality, cost effective alternative to using a pallet network to send their goods into Scotland. According to the European Environment Agency, a quarter of all trucks on the road in Britain are running empty and more than half are only partially loaded - let us help you reduce this statistic. 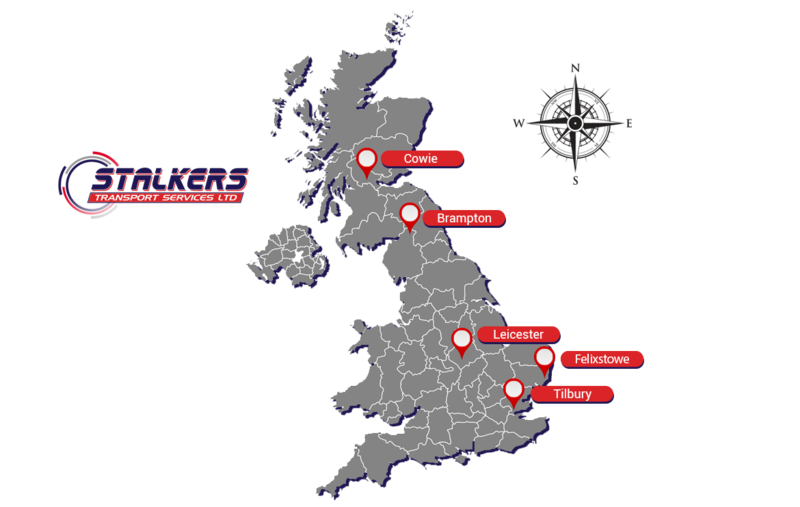 Stalkers Transport Services currently operates a UK wide distribution network not only for our own products but for our national database of clients. Daily we allocate upwards of 45 loads, up and down the country. If you have an empty vehicle and are stuck for a load home why not give us a try. If you are a distributor or manufacturer and would like an alternative, again, make that call. Stalkers Transport Services are members of The Freight Transport Association and all transit goods are insured to their standard. Additional insurance cover can however, be arranged if necessary. Working together means we can all benefit from cost savings and increased customer retention. Working together means that you are always kept up to speed with your deliveries and resource. Communication gives us control. Stalkers Transport Services operates three purpose built warehouses storing goods ranging from foodstuffs through to garden furniture, offering 30,000 ft.² of high bay racked space maintained to the highest standards of quality and cleanliness. We invest continuously in state of the art stock control systems, with online access for stock viewing for all customers. Stalkers Transport offer secure overnight parking facilities on their Brampton site with space available for up to 100 vehicles and trailers. There is 24 hour access to the security fenced, floodlit site, which also houses the benefit of security officers and CCTV. You can set up an account for this service or just ‘pay as you go’. Our location is ideal for changeovers. This allows drivers to maximise their driving time and increase productivity. Our fully equipped, dual pit workshop facilities are staffed by experienced technicians who are also available ‘on call’ out of hours. We carry out servicing and repairs to our own fleet onsite and also offer maintenance services to other operators.